AUTHOR’S NOTE: Just a little over two weeks after this camera (The BMCC "EF") was given to under a dozen reviewers, and a little a little over a week after this review was published, Black Magic Design has announced an MFT version of this camera. That camera will sport a Passive Micro Four Thirds mount that can be adapted to use with PL Lenses. That BMC "MFT" camera with the new mount will be available in December according to Black Magic. This new mount means that a much larger series of lenses will now work with this camera and in effect changes my opinion on the lens limitations of this camera. You should note both mounts are passive, meaning that there will be no iris control, or image stabilization. You will however be able to use adaptors for PL, M, Nikon, Canon – just make sure each lens will fully cover the uncommon (more square) size of this sensor. The "MFT" version of this camera will likely make a lot more sense for most users than the "EF" in my opinion. We’re in an age of a preponderance of choice. And while having the privilege of making choices is a luxury – it can also at times be a bit overwhelming. The search for the “perfect camera” is a fruitless one. It always has been and becomes more so with each new offering – especially as each of the new candidates continue to close in on becoming the “perfect” filmmaker’s tool. The “perfect camera” is the one that will allow you to most effectively translate your vision onto the screen. And for each of those ideas, for each of the shooting challenges, for every budget (or lack thereof) exists the (near) perfect camera. The key for me, is finding a tool that is ready to use now, one that I can use “as is” and that requires the least amount of tinkering and accessorizing before it can be put to use on a project. This likely has to do in part with the endless tinkering I had to do with the Canon 5D MKII as I worked with a multitude of companies over the past 4 years to make HDSRLs production-worthy with a multitude of (unfortunately) necessary accessories. Many of us love to innovate, to push the boundaries, and to discover new solutions to make a tool excel beyond its initial potential. Yet, truth be told, most of us would benefit from focusing more on how best to tell our stories, or on making the story stronger – that tends to pay off more richly in the long run that spending time on accessorizing our uber camera. To that point, I’m not sure that the Black Magic Cinema Camera will fit the bill "out of the box" for a lot of users out there looking for a production ready camera. That being said: this is exactly what I would say about most HDSLRs and even many digital cinema cameras… most seem to need quite a bit of accessories to work on full fledged-productions. Put my hat in the ring for someone looking for a camera that can be ready to use at all times, AND fully rigable for larger shoots. The Good: I think that this camera produces one of the most beautiful images in the cinema/video market. An image (Recorded either in RAW Adobe CinemaDNG format at 2.5K, or Apple’s ProRes 422 & DNXxHD 1080p) with very good detail (relative to other 1080p camera of course – not 4K+ as is to be expected.) In some ways less is more, for example Arri’s Alexa camera actually incorporates a 1/4 soft filter in front of its sensor to soften detail, and this camera’s sensor also gives a very filmic look and noise structure that many simply won’t be able to resist – and that is especially true at this price point of just under $3,000. The lack of resolution (Relative to 4K+ cameras) in many ways oddly makes it look more like motion picture film. The blacks seem to fall apart in a very organic way. So where does the Black Magic Digital Cinema camera (or BMCC) fit in the marketplace? From the moment this camera was announced at NAB this spring, I was befuddled by the form factor, and the choice of sensor size – a slightly smaller than micro 4/3rd size sensor when Super 35mm and greater have been all the rage since the Canon 5D MKII. Yet I was also quite intrigued to see what this new RAW format looked like. I was skeptical based on what I saw then – and I have since been very pleasantly surprised. 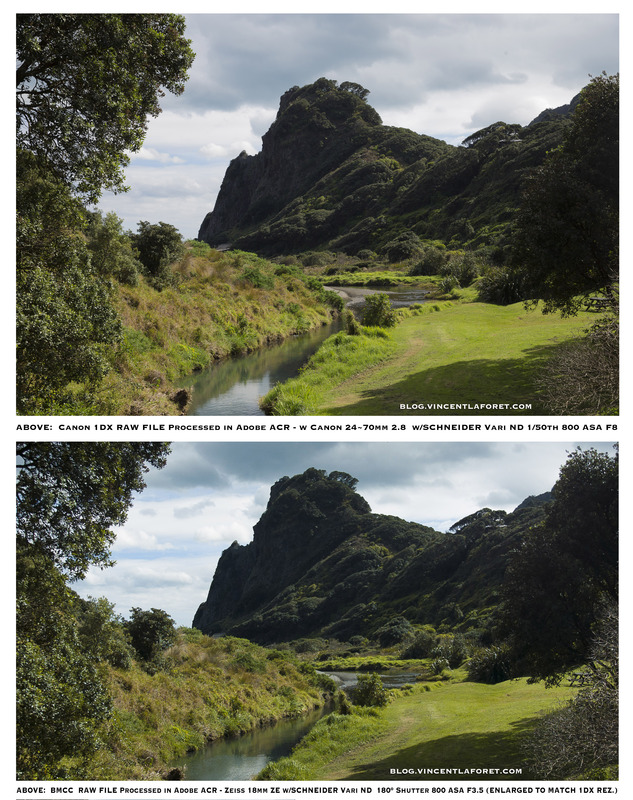 I have included a comparison of the two cameras with the same Zeiss ZE 18mm 3.5 lens above – and that should demonstrate the relative crop factor between the two cameras on the same lens. It’s significant of course and likely my single biggest reservation about this camera. You will also notice several examples that show what I would call “difficult” lighting situations in terms of dynamic range. I haven’t had a chance to play too much with mixed available light yet. 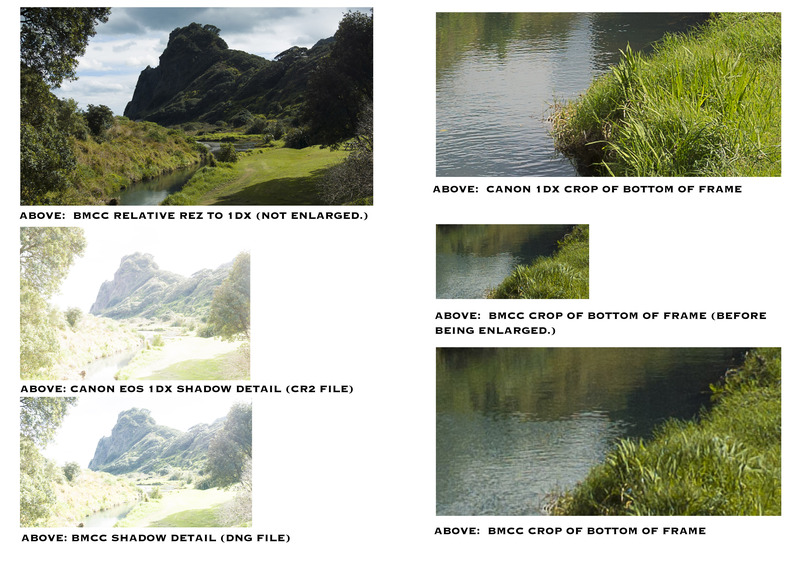 With each example, I have included what the RAW DNG file looks like in Adobe Photoshop CS6’s Adobe Camera RAW, a “Toned” version, a detail of the highlight detail, and shadow detail – to show just how much information is hiding in those DNG files. I haven’t had a chance as of yet to output video file, nor to process these files in Black Magic Resolve (mostly because my software USB dongle is in checked luggage! I am working on this article on a flight back from Australia.) I will put some video up at some point, both off of the RAW BMCC format, as well as the internal ProRes Codec it can record in, as well as examples of grading in DaVinci Resolve. I should say the workflow is a bit of a bear – but that is to be expected with almost any RAW format these days to be honest. Many will quickly default to the Apple ProRes codec in my opinion – as any Arri Alexa user will tell you. Thank you for purchasing Blackmagic Cinema Camera! We have worked hard to produce a camera that’s designed from the ground up to have a very wide dynamic range and to produce files that are "flat" which means they preserve this wide dynamic range. To this I say: mission accomplished. This is likely one of the top 5-6 sensors in the market today in terms of color rendition, dymamic range, and noise structure, and it creates an incredible sharp image. This will allow you make your creative decisions by using the included DaVinci Resolve 9 color correction tools! We think this means you get a cinema style shooting experience where you capture and preserve more of the image so you have as many creative options as possible. An added benefit of the 2.5K sensor is you capture more pixels than you need for HD so your HD images get a wonderful anti aliased look, similar to shooting film! The additional pixels are welcome – but don’t come close to giving us the creative post options (in terms of cropping after the fact, or pan and scanning) and as far as stabilizing an image (such as Adobe’s Warp Stabilizer function) as you would with say a 4K or 5K image. The single most “befuddling” decision with this camera is the choice of such a small sensor size. My guess is that it was one based on economics and how a larger sensor would not only be more expensive to produce, but also the fact that having to process RAW images from a larger sensor at 30fps would also lead to much more expensive internal hardware within the camera. A larger sensor = more pixels to process, a bigger processor, more memory etc etc – ergo a more expensive camera that would quickly reach the price of a RED Epic or Canon C300/C500. But I regret to say that I find the sensor size to be the main limitation with this camera and my use of it. I’ve become quite used to the Super 35mm sensors many of us havel become used to working with (and bought lenses for,) and the shallow depth of field and access to lenses it affords us as filmmakers. While I’m not a big fan of ultra-wide angle uses in a lot of narrative scenes myself, those lenses can be very important for use in creating establishing shots, full body shots of actors in an interior scene, or for creative purposes. For such an example one need only look at the masterful use of ultra-wide angle lenses in "Tree of Life" by Director Terrence Malick and DP Emmanuel Lubezki. Do not under any circumstance underestimate the challenges this size sensor will give many of you and your existing lens collection. Remember this is an EF lens mount – not a PL… and there is a limited amount of ultra-wide angle glass available that is suitable for pulling focus on a narrative scene, and that is optically sharp enough to survive this crop. They do of course exist – but you will need to purchase/rent this glass which should be a factor in your decision to work with this camera. The Tokina 11~16mm lenses are good – but it’s not easy pulling critical focus with these wide open. I would be remiss in failing to mention the fact that many of the best films and documentaries in history have been shot on 16mm and Super 16mm sized cameras (which are roughly the equivalent size of the BMCC sensor.) One key point here is that if the lenses meant for those cameras could easily work with this camera then we’d be in good shape. Unfortunately the size of this sensor means that many of those top lenses won’t be compatible with the BMCC (they either won’t cover the full frame area or simply aren’t available with EF lens mounts.) Therefore users will have to revert to using lenses meant for HDSLRs – and therefore have a limited choice in the wide angle range. We have also included a large screen for easy focus and metadata entry as well as standard file formats that work with all video software. We hope you connect to this camera in a creative way and produce some amazing looking images! We will be extremely excited to see what creative work you produce! Seeing the back of the reflective screen on a sunny day can be close to impossible at times to be honest. And holding the camera? Well let’s just say I’m glad they included a camera strap with the kit! I also remember reading something else that Grant Petty said online or in a press release, something to the effect that he wanted to make a camera that did not require a bunch of accessories to put into production. That is another significant miss (other than the sensor size, and lack of an interchangeable battery) of this camera. While you can easily shoot indoors with this camera, forget being able to pull focus on while looking at the touch-screen LCD on a bright day. Pulling focus, setting exposure – let alone HOLDING the camera can be a challenge. I’m a little stunned by the choice in ergonomics of this camera to be honest. I hate to say it: but style won over function with this initial design. Oddly enough (and this is a bit counter-intuitive) I am strangely drawn to the design of this camera. It fits nicely alongside many other Apple products and could easily find a place in the Museum of Modern Art someday given its minimalist design. Every button, menu, and curve is quite elegant to say the least. I have to say that I’ve rarely, if ever, been stopped by as many people who were incredibly curious to know what I was shooting with. From random strangers, to airline personnel, to fellow visual artists – people are drawn to the design and shape of this camera. It does look very futuristic! The camera has led to several interesting discussion with random strangers. That being said, the original iPhone had a specific reason you couldn’t have an interchangeable battery according to my discussion with people on their team: the electronics were so delicately stuffed into the frame of the phone that moving ANYTHING was simply too delicate of an operation. Given the fact that the BMCC has a nice big door to access the SSD card, I believe they should have allowed access to a removable battery. Black Magic claims 90 minutes of shooting time, and 2 hours of standby – not quite enough for most of us. Of course I understand we can get an external battery unit… but that’s besides the point and yet another accessory we have to lug around. I am sad to report I missed several gorgeous shots in Australia and New Zealand this past week because either a. the battery died or b. I was too busy constantly turning the camera off to preserve battery and therefore missing key moments. I tried in vain to charge the camera off of USB power. Most HDSLR users who are used to working with one battery for a few hours will have a rude awakening when it comes to using this camera without an external power source. If you kit this camera up – no problem. But for those of us who may have wanted to travel with a relatively small camera – well we’re not quite there yet. I do wish a hot shoe had been included with this camera – with a little EVF adaptor that (similar to the Panasonic Lumix hot-shoe mountable EVF which is pretty fantastic (and a pretty nice little camera too to say the least!!!!) allows for easy composition in a bright environment. All in all – I think this is a fantastic first entry (notably in the image quality/sensor/dynamic range performance) that leaves a lot to be desired in terms of ergonomics. I do however think that should Black Magic decide to release a Super 35mm version of this camera, with a bit of a redesign to the ergonomics of the body – it will be a company to keep a very keen eye on over the next few years. Some are already calling this the “baby Alexa” and touting how easily the image will intercut with that Arri product. I don’t doubt them – although I assume that the BMCC “B” camera will hopefully be shooting the tighter of the two shots… Until I do side by side tests with the two cameras I’m going to refrain judgment on whether or not that claim holds water. I also can very easily see that people will build out some pretty darn nice cages with great accessories to make this camera very production worthy. I think there’s no question this can happen – and more easily than with many HDSLRs and with an image that quite frankly destroys almost all (if not all) HDSLRs. This camera was definitely intended to be accessorized and not necessarily to be 100% production worthy out of the box. I just think a different molding of the shape on the right side would have allowed for the easy handholding of this camera. I guess I’m a little disappointed because I was hoping to be able to work with this camera "as is." In the end, even with every possible accessory – the size of this sensor will remain a challenge for many. Don’t underestimate how much of a 1.6X crop factor (when compared to Super 35mm) or a 2.4 X crop factor (when compared to a full frame 35mm sensor) can be in your lens selection. Your 18mm is roughly the equivalent of 44mm lens… getting those nice wide cinematic shots we all love will prove a challenge for most on this size sensor. Other small notes: the camera is quite a bit heavier, and bigger than it looks. The lens port extends out quite a bit further than you might expect. The lack of HDMI out (in favor of HD-SDI) is welcomed by me – but will create problems for all those wishing to use many of their current HDMI EVFs and LCDs. Also: SSDs aren’t cheap… keep that in mind as the amount of data you shoot with this camera can feel quite “Epic” pun intended. Expect to invest $500-$1,000 in SSDs to start with if you are going to be shooting this in RAW mode. You must also purchase a reader (or USB/ Thunderbold cord) to ingest the SSD. There is no way to download footage straight from the camera. Setting a specific aperture is not currently possible. You can hit the IRIS button and then open the aperture up or down one step at a time – but there is no read out of what T-Stop you are using whatsoever – you never “quite” know where you are on that front. You cannot shoot anything faster than 30fps at this time nor can you set any specific custom “looks” on your image. And lastly – there is no way to format an SSD disk – there is actually no “format” menu item in the camera which is odd. You need to trash the contents of your SSD on your computer before inserting it back into the camera – which is odd. All this being said, I know a lot will LOVE this camera simply for its brain 😉 By that I mean its sensor and color science. Personally I’ll be waiting for the Super 35mm version of this camera before I can consider it as my “A” body. That’s my personal view on things of course – as I mentioned at the start of this post: I’m sure (and welcome) others seeing things differently. Having access to a RAW image for under $3K is definitely something that will be impossible to ignore by many … oh and to that point, did I mention that Black Magic absolutely NAILED the pricing on this camera? The price alone will prove simply irresistible to many and more than justify buying a few thousand dollars worth of accessories to make this camera production worthy. Don’t’ forget though: at the end of the day there is one key factor you’ll never be able to improve: the small sensor size combined with an EF lens mount – and the lack of wide-angle lens choices you will (at least temporarily) be faced with. I look forward to seeing a Super 35mm version of this camera with some ergonomic improvements and a few extra production-friendly bells and whistles and a greater selection of frame rates. One thing should be noted: when asked for an alternative to this camera anywhere near this price point…. I don’t have any easy answers. And I’m not even looking to cameras that can shoot RAW – I’m looking for cameras that can produce an image that will come close to this quality for under $6,500 … and I’m having a hard time coming up with one at this time. @Daniel Lowe, Hi i have a BMCC 2.5k MFT mount camera.I am looking to shoot mainly music videos but do intend to dabble into short films and event coverage. can you advise on the best lenses to get. so far am for a great wide angle lense, a prime and a standard lense with any two more lenses Keeping in mind that i want to shoot music videos for will the ok for short films and event coverage as well. I have a tight budget so not looking to go all out. Looking for good quality for decent prices. also is reasonable/possible to use a MFT-EF adaptor so i can used canon lenses, if so got any good adapters in mind? Vincent. You must be a stills photographer! First clear demonstration of the flex in a Raw file. I guess rating at 100 is the way to go. it is amazing,i like it,.but i just buy a camera a few days ago. Bravo! nice review vincent, the ergonomics was a big concern for me as well, but I think I can come up with some creative solutions for lack of wide shots. One think I was a bit curious was in how bad is the rolling shutter compared to a dslr? That’s the one test I haven’t had a chance to do. It’s there for sure – but it is w/ all CMOS sensors. Footage I got so far has been impressive – but RAW workflow is a bit of a bear so I’m behind on half a Gig of RAW DNGS. Great article Vincent! Was waiting for your thoughts on this one before making any moves — happy I waited! Looking at the specs, the sensor size was my biggest concern as well. I too will hold out for another offering from BM, closer to the super 35mm. Really enjoyed the C300 PL on a recent shoot. Rented a Angenieux 17-80mm lens and it was pretty insane. Sharp sharp sharp. Not knowing what aperture you are on seems very very strange, how could they leave something like this off? Not good for when reshoots are needed. 2.5K DNG RAW image, Resolve 9 and Ultrascope, for $3K. It’s not even worth arguing. Perfection is an illusion. Good and balanced article Vincent. I tried to shoot some handheld stuff today – no dice, the balance of the DSLR form factor is way of (and I usually have a pretty steady hand, even wit bigger rigs). 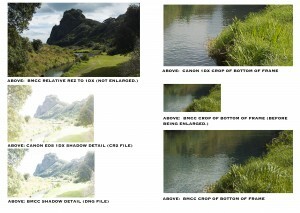 This over analysis of the BMC’s sensor has got me thinking that people have no concept of cinematography at all. There are many great films shot on 16mm sensors. And the concern over lenses not being “wide enough” – most films are shot between 25mm – 35mm, with apertures of F4 – F5.6. I think the “SLR revolution” really spoiled a lot of people and created an ideology of “large sensor = more cinematic”. The unorthodox size of this sensor. And there lies the problem. What you are left with are a lot of lenses that weren’t necessarily designed to pull focus for cinema. Last I checked pulling precise focus on an 11mm lens that wasn’t very clearly marked is difficult matter the lens. There is a preponderance of fantastic 16mm and super 16 glass out there but most are not designed to cover this rather square sensor and size. And btw – I shoot between f4-5.6 for narrative and at most f2.0-2.8 when only one actor is in frame. Nice article and I have enjoyed reading and watching your work! I think an important point that is missed is that this camera and software will allow for the first time a chance for young student and enthusiast filmmakers to have a chance at using a camera that they may actually be able to afford. I enjoyed the expierence when I downloaded the RAW files available to play with them and create my look. My first RAW workflow and I loved it, reminds me of grading my RAW timelapse sequences and bringing the RAW files to life. Black Magic is doing something that I think some companies will be looking at very closely. They made a camera that uses no special proprietary technology and made it affordable. This is really going to change things and give more options to people and really open some doors for individuals trying to get noticed with their work. I think the sensor size with serious professionals may be an issue, but when you look at the images this camera is producing, this sensor seems really amazing for what it is. Thanks for the post, I am really interested in this camera and it is nice reading about what others think. How was the vertical sway on the slower CMOS sensor? Did it seem to write faster and a Canon 7D? Thanks for the review! Did you read about the article one river media? Actually the wide angle Sigma (at 8mm) looks quite good. In cinematography you rarely shoot wider than 20mm. Surely it will not be for low-light wideangle scenes.. The sensor size cuts both ways. It is too big for S16mm/16mm lenses to cover so can’t take advantage of fast wide range compact cine zooms that are a major advantage of the smaller format for some genres. You mentioned a desire for a RAW Super35 version, have you not checked out the KineRAW S35? very simular but ‘only’ 2K res and $6000 price point. Nice write up. I’ve ordered one as a B camera to my F3 and have no concern about a 1.6 crop factor. As you suggest, more for the tighter shots. I think I also remember reading that the sensor was chosen for availabity and cost. A larger sensor would not have necesarily meant more pixels as sensor size and pixel density are mutually exclusive. I took some time with John Brawley’s files and was really impressed with how much flexibilty they demonstrated in Resolve. OR a cable? So can download the files from the SSD, when it is IN the camera? In the first 100 years of cinema how many times have been used less than 18 mm for drama films? @Vincent Laforet, Sorry if I sounded condescending, Vincent, but when I said “people have no concept of cinematography at all”, I didn’t mean you (I admire your work a lot to be honest, especially “Mobius”), I meant the amount of people on forums and twitter, etc, that are dismissing the BMC simply because it has a small-sensor. The point I made about 16mm sensors wasn’t to suggest using 16mm lenses on the BMC (which would be awesome), I just wanted to make the point that many great films have been shot on sensors smaller than the BMC’s sensor. As for the Tokina 11-16mm F2.8 (or the Sigma 10-20mm F3.5), personally, I think they are wide enough. I rarely every go any wider than 24mm (as do most cinematographers), even when using a 5D, or 16mm when using a APS-C sensor. I only go wider than a 24mm FoV when I want to create a certain aesthetic element. Who knows, perhaps if the BMC market grows extremely large, maybe Sigma, Tokina, et al, will release faster versions of their 8mm, 10mm and 11mm lenses? balanced and thoughtful, great work Vincent.Like many 5d2 users I’m looking for the “step up” after three years of 5d shooting’ but is this the camera? Keep the thoughts and examples coming please, we need all the help we can get out here,to make the right decision! Agreed – I think we need to wait for version 2.0 of this camera or someone else to step in…. Thanks for your review. While you can’t beat the price, I would gladly pay double or more for the same camera with a bigger sensor, XLRs, replaceable battery, and “in camera” formatting. How would you compare the Blackmagic camera for general use to the Canon 1DX and Canon 5DMKIII? Great article, feel this camera will appeal to a whole new generation of up and coming film makers who are much more comfortable with the IT side of things and aren’t bothered with SSD’s or offloading data and keen to get access to beautiful images at a price point never seen before. As for the repetitive comments about sensor size……what is the other $3000 camera I should buy instead ?? Great question! But it’s not quite a fair one as I don’t think you’ll be able to use this one without a minimum of $2-3k of gear (evf or LCD and cage plus external batteries ) so I think you should be pricing this camera at $5k. You should consider C100, Sony fs100 and 700 – but none offer raw…. If this camera had a larger sensor it would be a no brainer… Right now I would say sacrifice RAW for overall useability and more features/sensor size. Love your blog and love this entry on the BMCC. With everything out there cameras, lens etc. when a person is starting out what should we learn about? There are so many terms that I myself get lost in. I know I’m not going to be able to learn everything but nobody said I can’t try. What are a few bullet points should a novice like myself need to learn about? I feel the specs of cameras look great but when you don’t know how to use them or understand them fully can be overwhelming. I hope the question that I am asking makes sense to you. Good write-up Vincent, I appreciate the depth of discussion and images. I’ve followed this camera before I met and talked with the President of BMD and started out with similar complaints / worries as you have listed here (crop factor, internal battery, workflow, monitoring, ergonomics). s35 and s16 are the standard imaging sizes in the industry and the BMCC sits beautifully right between them. Granted, we have a harder mount to work with in regards to superwide fast lenses, but Canon and Sigma do both have 8mm options available. And speaking of glass, the Rokinon lenses have been giving the far more expensive Zeiss a run for their money. One must certainly remember the atrocities of shooting wide and deep on the Canon 5dMKII – between aliasing and moire, we were in a world of hurt unless everything was shallow DOF. 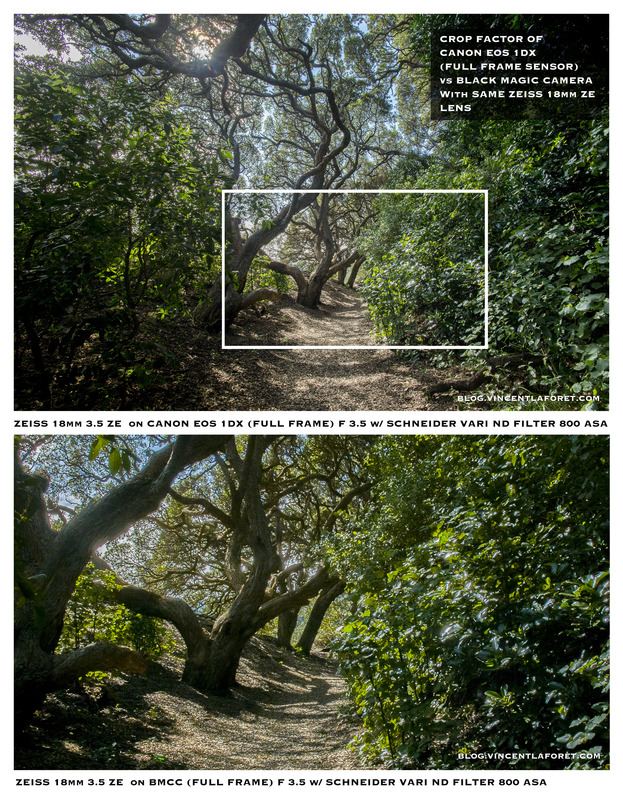 Thus another benefit of a smaller sensor is the more manageable focus to work with – especially in dialog scenes. Regarding the battery – I do not recall RED or Alexa having internal batteries. I do not recall anyone on a professional shoot without some sort of power brick. Taking in 12-30v DC power allows many generous options regarding power. Ergonomics – we had similar issues with DSLR’s. Workflows – we are currently experiencing the hardest workflow now. SSD’s will become cheaper and larger and faster, thus our workflow will only become EASIER and less expensive from here on out! 5. A difficult workflow dealing with h.264 before Adobe CS 5 took charge. 6. Bad monitoring, no clean HDMI out, only soft blury SD image out. 8. No possibility of monitoring audio – needed external juicedLink or separate audio recording. Given these drawbacks, you and others raved on the POSSIBILITY of creativity with the Canon. I see the BMCC solving these problems and while not being perfect, being much closer to what we always wanted. John Brawley shooting alongside the Alexa and C300 can attest to the image quality of this baby Alexa just fine. Have a background in stills photography and nothing would convince me to sacrifice RAW…..do you have any experience with working with RAW as it just seems like a really strange thing to say. Especially given the other cameras are more expensive ?? RAW is definitely the way to go for mid to high end productions. The truth is when you shoot a RAW file 24 times a second – that amount of data, and the time it can take to process it, store it, output it etc – can be overwhelming to people who a. don’t have the hard disk space b. don’t have a powerful enough computer / GPU c. are on tight deadlines. Ohhhh, OK, thanks….now your comments make complete sense and now I know why I am confused. One of the reasons I initially got interested in the BMC was actually because of the large amount of data per image. In some ways I have been at the sharp end of this stuff for a while with industrial video cameras (not as a filmmaker) and any sort of compression in the images would frustrate the life out of me. It’s funny the different perspectives, all the stuff you commented on as ‘challenges’ are neither here nor there to me. They could have shaped the thing like a teapot and put the lens on the bottom for all I care…..just give me high data rate RAW (higher the better) with a decent dynamic range and I will sort the rest. Also that multi voltage power source with internal battery spec with the BMC is a dream come true….forget USB’s and think cigarette lighters in cars….they are ubiquitous and mobile. My external power pack for my notebook can even power this camera and I take it with me everywhere. hmmm – I tried my iphone cig adapter w/ standard mini to USB cord to power camera in car… no go. Do I need a heavier duty one? Give the USB Cig Lighter thingo a miss as it will typically convert the 12V from the Cig Lighter into 5V and drop the max current that can be drawn, meaning it will take forever to charge the BMC…..just take 12V directly from the cig lighter into the 12V – 30V Port DC Port in the camera (will charge in no time). If you are unsure how to do this then just get the right connectors and drop into an Auto Electrician for 15 minutes and they will make one in a jiffy. You could even take jumper leads straight off the 12V car battery if you so desired. Seriously, people are seeing this internal battery as a negative simply because it has been a long time since techo’s, film or otherwise played directly with ‘raw’ power. Everybody is chasing special Film VPacks but really there is a massive list of stuff that will work. Heck if you want you can grab (steal when he is not looking) a mates 18v Lithium Battery that he would use for his drill and connect that into the camera…..pretty much every garage has one of those and they charge in next to no time. Not pretty but handy to know in an emergency. Whatever you use must supply clean DC power between 12V and 30V. If you want confirmation just go back to the BMD guys, am sure they would be happy to help as they would have designed the multi voltage interface and battery into the camera thinking they were doing everybody a huge favour.,,,,which it is. Thanks for this. My feelings are exactly the same on this camera. Great images, but that crop essentially forces me to spend 10k on the wide CP2 superspeeds. I love my (nikon/zeiss/rokinon) lens collection and know it intimately – now I have to junk it? If they can do an S35 one at 5-6k I’ll be the first in line. I’m also going to look at that new KineRaw camera. A great read. A couple of things to think about. With regards to the battery, even with the camera just now starting to ship, there already aftermarket batteries that wouldn’t significantly add to the “naked” form factor of the camera. Im convinced by the end of the year there will be a done of discrete external battery options that can fit to the camera. I quite like the VooDoo from Action products, and it offers an interchangeable battery option. It’s perhaps a bit pricey for some, but it also offers other connectivity options and it won’t be long before there are cheaper options I’m sure that will still mean you can use the camera as a walk around I’m sure. I’d also take issue with mentioned the cost of storage in choosing to use SSD drives as media. I think if you actually compare the cost per Gb between CF, SD and SSD, SSD is by far the cheapest per GB. Of course that camera records at a phenomenally higher data rate, so of course you NEED a lot more storage. But I think it’s a bit unfair to count the cost of media as a negative when that is the whole point of this camera. That it does uncompressed RAW. AMAZING PLACE AND COUNTRY! Good eye! Once again BMD disrupts the market. It has done it with capture cards, Resolve and Teranex. Now it’s time for videocameras. This is a VERY serious wake up call to Canon, Sony and Panasonic, big corporations that have been adding incremental upgrades to their cameras for years, but always left something out so people would buy the next one. This is over. For good. The new BMD camera trashes not just DSLRs, but every single video camera below the ALEXA for narrative production. The 3k price is a no-brainer. BMD is going to sell dozens of thousands and an entire universe of accessories will develop around this little marvel. You won’t need much though: The great bebop cage with VF arm and battery holder, an SDI EVF, a Denz shoulder Pad and the new ARRI rosette-handgrips. Done. In terms of lenses, ARRI’s LZW.2 T2.6 15.5-45 is the only lens you might need, with the Tokina 11-16 for wider shots (when you don’t need to pull focus). On a smaller budget people will get away with ZFs. It’s amazing how far we’ve gone in the last 5 years, when serious cameras cost a small fortune. Nowadays for less than $10k you can buy a BMD for narrative and a C100 for run and gun. No need for anything else. The C100’s codec is a bit of a dissapontment to be honest, but after BMD pressure we won’t see Canon/Sony/Pana half cooking their cameras anymore. Next year BMD will most presumably release a S35 version with 60p and a few oncam buttons for Run&Gun, forcing every other manufacturer to include those specs at low prices or risk lose their markets altogether. Great times to live in. I use Zeiss’s LZW quite regularly… it’s a $20,000 lens and I don’t think the majority of people buying a $3K camera can afford it (they can rent it of course.) That isn’t to say many out there won’t use it of course with this camera- I have used that lens on the 7D on several jobs. Bepop cage looks awesome – another $3200 (but well spent) Wooden cameras is closer to $400 I think. etc etc – I just think it’s important to point out that getting this camera will not be inexpensive. Many high end users won’t blink at these prices given the altenatives of course. I just think it would be irresponsible to discuss this camera for those young filmmakers coming in with the dream of a $3K RAW camera – and not mentioning to them that they will need to spend at least $2K-6K in accessories (and up) to make it production worthy. The title of this blog post sums up how I feel. When we assess the true potential of a camera, I guess it depends greatly on our perspective. I guess I am old enough to remember working with motion picture. Ever try going handheld with a Panaflex Gold? How about trying to shoot right out of the box with an Arri SR without any accessories? Have you ever seen the external battery for a Moviecam? I guess I will stop reminiscing about the “good old days” and get to the point. A true cinematographer got to know the strengths and weaknesses of any given camera. They played up the camera’s strengths and used the weaknesses to their advantage to create stunning images. There were the odd contradictions about how best to use an Arri versus Panaflex or wether 16mm film was a valid medium in light of 35mm. Bottom line, you picked a camera based on its potential to deliver the best images based on the project and, unfortunately, budget. The Blackmagic Cinema Camera shows far more potential for phenomenal images at a price point that is unbeatable. Does it need accessories? Sure, but so does every other camera. Every camera I have used has needed accessories because it hasn’t worked quite the way I wanted it, including the supposed all-in-one camcorders. Just remember, accessories used to be necessary just to get the camera to roll, the BMCC only needs a few accessories where we used to have to use dozens. Any photographer or cinematographer relying on auto focus or whatever the camera’s ease of use focus system on a project without confirming it at least one other way is going to get burned one day. Arriflex and Panaflex motion picture cameras never had auto focus or peaking or zebra, yet they consistently churned out beautiful, in focus, imagery. How? The skill and artistry of the camera department. Focussing is an art form. It was always part of the camera package prep to put a piece of tape over the lens’s focus marks and create our own because the marks drifted slightly. Shots were focused based on a complicated analog tool called the tape measure. Even on a big set the Alexa and RED focussing are backed up with the old analog method, why should the BMCC be any different? I know many of you will say you want a camera that you can whip out and start shooting right away. I can only ask that you show me any other camera that can and is affordable to the rest of us who are not being subsidized to go out with pre-release units. The sensor size debate makes me laugh because that would probably be the biggest argument in the film days. Which is better, 16mm or 35mm? The occasional cheeky person would bring up 65mm. You know who won? The cinematographers who were able to shoot in any format and create a beautiful image, including shooting in super 16mm and processing it to 35mm. Super 16mm film is still used to get beautiful images for HD, just look at The Walking Dead. Why should a small super 16mm sensor that records RAW be the subject of disdain when larger super 35mm record in a compressed codec be used as the higher standard? It isn’t even 4K RAW which was brought up for stabilization purposes. Use a tripod/steadicam/dolly/slider/jib. Or that 4K could be used to reframe. I know it is a radical way of thinking, but do what we did in the good old days, frame it properly when you shoot. Oh yeah, I just finished a project and I would have given anything for a slow workflow from the BMCC if it meant I would have had far better images coming out of a 5DII. Any camera can create beautiful images, it just depends if the shooter understanding the limitations and strengths of the camera. The point being that the BMCC has far more potential as a tool to create beautiful images in and around the price point. Rather than focussing much of the conversation on just its limitations, a better discussion would have been how this can be used to elevate the science and art of cinematography. Well I guess those 4 years of journalism school paid off: I got the headline right 😉 Agree with you for the most part wholeheartedly. I do think there are a few other surprises with this camera that I haven’t written about that will make it clear there is a difference between shooting on 16mm film vs this digital size sensor… more to come. For most medium sized corporate videos and/or web spots, the plethora of Cameras on the market do and don’t help. We all strive to one day shoot a meaningful documentary that gets distribution or even a small movie production, but the reality is that most of us have to do with tools to crank a product and pay our bills or even support families. Having said that, some cameras would not fulfill the needs of many of us and one of those Cameras is the BM. Yes, you could shoot with it out of the box, but you’d be still short maybe 4K in peripherals that would make the camera a full flesh production camera. On top of that shooting DNG files would shoot up the cost of post production, where there is a need for more and faster drives and/or processing power. I was very interested in investing on one of the BM boxes, but I can see that for now the return would not be as fast, as the trusty 7D has been. Thanks for the very informative article. Appreciate it. And agree on the 4K of peripherals. I was trying to make that simple point. @Vincent Laforet, There are a lot of crazies in this biz, that’s for sure haha! 🙂 I own the Tokina 11-16mm, it’s very sharp on my 7D, I’m sure it will be sharp on the BMCC – especially given that the BMCC will be using the centre of the lens. I can imagine the 11-16 being difficult to pull focus with on an Epic sensor, however, given the small sensor of the BMCC, focus-pulling should actually be a lot easier as small sensors have much deeper focus. On a side note, love the blog and reading your thoughts and opinions – keep up the great work! May I say something that may put this into perspective? The “magic” number , under 3,000 US dollars? Yes- and the response: how much are the potential negatives/challenges of this camera worth to you? How practical would it be to shoot anamorphic? Never say never… but I think it would be very tough. @Vincent Laforet, We need an EVF or LCD with DSLRs as well. And anyone doing commercial shooting on a DSLR is most likely using a battery grip or external battery, as well as a cage or rig, so I’m not quite seeing the difference on a professional level. And for overall value, the $1,700 worth of software equals it all out. I’m looking forward to stepping up to DaVinci Resolve. Most folks I know don’t bother with RAW video, too clunky and time-consuming. Shooting in ProRes seems perfect. My time is money, so the time I’ll save converting H.264 files to ProRes is also a savings. The prospect of plugging in the SSD and immediately starting my edit is exciting. No more waiting for Compressor or MPEG Streamclip. One last thing, the 5Ds have a 3’ or 3.2” screen with buttons and knobs, where the BMCC has a 5” touch-screen. Seems that’s being overlooked a bit. At the end of the day, the Blackmagic image smokes the DSLRs. Better sensor. More dynamic range. When we look back years from now at what we’ve created with our tools, the Blackmagic will just look better. And honestly, I’m growing tired of the super-DOF of DSLRs. Where they look like film on crazy steroids, the BMCC simply looks like film. I’m going to wait until everyone get these cameras in their hands. I’m not arguing here. I feel like I have struck a chord with people who have a very strong dream. I don’t want to be the bearer of bad news but it seems I am for some. 1. Most people use the Canon batteries, and swap them out. Ask Shane Hurlbut and how often he used the LP-E6 on “Act of Valor” – a lot.. the point is: you CAN swap them out. I myself and many others (and Shane later on) all use external batteries on extended shoots. 3. Agreed – most people will go to ProRes. 4. Big screen = lots of reflections and MUCH more reflective than 5D MKII/III screens btw. Either way I rarely used the back LCD on the DSLRs – but the point is that I could when I needed to. I can’t w/ the BMCC in bright daylight 1/2 of the time. 5. Better sensor and image no question. But – I am looking to see what others think about the way this camera handles motion. The BMCC does look like film. And thank you Vincent, for your blog, and for all the time you take to interact and educate. Thanks Rocco. I like to shoot in the dark as well 😉 Read about side by side last night in American Cinematographer I believe… looking forward to it! did you ask yourself this question when you started the whole ball rolling when you used the Canon 5D for the first test. If you had and that had stopped you, what a loss it would have been. If you don’t expect me to expect progress in 4 years… then we’re all in trouble. I want to push things forward – not live in the past. I trust you can respect that. Seeing manufacturers make the same mistakes another manufacturer did 4 years ago is not something any one of us should expect. The noise, so again for a live concert with dark area without lights it’s not the camera… I was shooting yesterday and I was @3200 iso, the BMC as a maximum of 1600.. The battery … difficult to understand this … so if you have a battery pack it will be heavier again so you need a rig, so it’s for professional not semi professionnal … like the 5D without equipment can be. The only think I was really excited about (like everyone) it’s the outpout format Prores DNXHD, because the H264 is a bit difficult to work with, even with simple correction and big correction are just impossible. The raw is I think fun to play with but you need a lot of hard drive, a very good computer … again it’s more for professional or for production than independant. Thanks again for your review it’s always a pleasure to read advices from pro. Ps : If you read this comment, I wanted to know if you use aerial photography (RC not Real), and if you do. Do you hire a company to do this..Are you doing this often … How the final client likes this type of point of view … please tell me. @Max, Hum as a student, I think you don’t think just about the camera but the entire workflow. I didn’t test the camera but I think the workflow too expensive for students. In raw, you need a good computer I test very quickly the files into Davinci. I didn’t understand how you are working with raw and a NLE. You put the files into davinci, you export, then you put this into Premiere and after again you put the files into resolve ? Yes that’s good, how you are doing if you want to use third party plugin like magic bullet Looks ? you need to convert into flat files in prores ? So what is the advantage of the Raw ? I’m thinking about this camera this the NAB, but I think I’ll wait to see more reviews about it, and may be new camera from the photokina for example. @Max, And I forgot, yes in theory with the raw you can do everything … and it’s I think not the best way to learn. Because with H264 if you didn’t select the correct color temperature, it’s very hard to change it. And you need to think carefully what will be approximativly you final result. With the camera the danger, is to don’t think about the final result and say oh I don’t need to care about lighting or color temperature I can change everything in post too easy. Hi Vincent, I have a photo background like you. One thing I’m interested in was the DNG’s that BM posted. I was able to do amazing stuff in Lightroom to grade them and snyc the edits with the other DNGs for an image sequence export. I personally can do so much more in Lightroom to get a good image than I can in FCP Color or anything I’ve tried. But the Lightroom workflow working with stills to video was so tedious. Do you know a grading software that is anything like Lightroom? I love how it handles highlights, shadows, and I love clarity to get contrasty but with good dynamic range? Or do you foresee some workflow that could work with Raw video this way straight up? If I could get BMCC at s35 size, with this ability to edit in LR, I’d pay sooooo much more for it. Yes – Black Magic’s DaVinci Resolve… incredibly powerful and it comes w/ the camera for free! Hi Vincent – a huge thanks for this in-depth and hands on review. Definitely appreciate the time and care you have taken during your extremely busy schedule. Quick question: Are Zeiss ZF.2 lenses compatible with an adaptor (Fotodiox EOS Pro comes to mind)? I imagine the new 15mm Zeiss ZF.2 would be a nice fit with this camera – wondering if only the Zeiss CP.2 and ZE versions are compatible? Until I try it I can’t say for sure. Perhaps someone here will chime in. I don’t own any ZF.2 so I can’t say for sure – better to be safe than sorry! With all due respect Vincent, you were reviewing this camera like it was a direct competitor to other cameras in the same price range, and that is unfair. There are NO OTHER cameras in this price range (~$2k) that deliver the same beautiful, uncompressed, RAW image. For those who want a BMCC with an S35 sensor, just get a RED Scarlet or a KineRAW both for around $10K. Want to edit real time RAW footage right of the camera? FCPX works great. I’m having a blast playing around with the currently available footage. You can not currently grade the full 12bits from the DNG file due to a FCPX bug, but I presume that should be fixed soon as well. Most will prefer to round-trip to DaVinci anyway, choices are great. The field of view argument is also mute. There are currently available lenses that will give you a similar FOV as a S35 sensor (obviously not at the same focus length). The only currently lacking function is ultra wide lenses, but those I presume those will come, if the camera becomes popular enough. I was seriously thinking RED Scarlet to upgrade from my current DSLR setup, but no more. I’m ecstatic. Price is one of many factors. I am reviewing this relative to the general landscape of cameras that I use. @Vincent Laforet I have no doubt that there is a difference between shooting 16mm and the same digital sensor size since they are vastly different media. I was just equating the sensor size argument with the 16mm and 35mm film stock arguments of days gone by. Still, it doesn’t negate the argument that a small sensor providing a flavor of RAW could be far more valuable to me image-wise than a larger sensor that provides compressed footage which tends to fall apart, quite quickly in the case of my HDSLR shooting. This the importance of knowing the strengths and weaknesses of a given camera so the best camera image is “baked in”. Looking forward to the “more to come”. Hi Vincent, thanks for sharing your initial experiences with the new BlackMagic Cinema Camera. It seems your major issue with it – sensor size, is the same thing most of us thought was a miss on the initial announcement specs. No surprise there. I would say however that it is not so much the sensor size being small but the combination of the small sensor with a lens mount designed for much bigger sensors. As you and many have pointed out 16mm is a very valid image capture size with a very good range of appropriately sized focal lengths available for lensing it. If the sensor had good coverage from all 16mm lenses (it’s frustratingly close) and an appropriate mount – say 4/3rds or Emount so you could get more appropriately sized lenses and both have Canon EF adaptors along with PL adapters available. It seems crazy that they didn’t go this route when designing the camera. 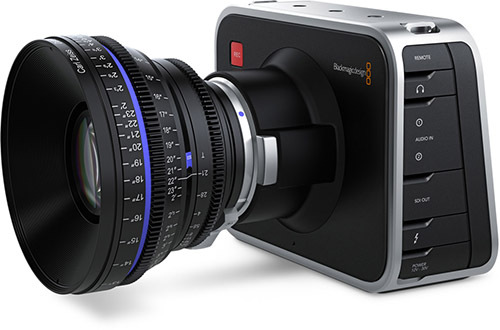 As it is perhaps we should start calling it The BMCCC instead of BMCC – Blackmagic Closeup Cinema Camera! Hopefully data rates and processing hardware in camera could cope with the whole sensor being used down the line then 16mm anamorphic lenses might be an option. Glad to hear they have zebras on camera – I had wondered if there were going to be any exposure tools inboard given the lack of mention of them and the inclusion of Ultrascope software. Are there any other exposure tools on camera? Waveforms? false colour? And how about a Log Gamma space for recording to non raw formats? I recently tested a Nikon D800 combined with an Atomos Ninja and was highly impressed with the results – a very capable cheap Bcam for an Alexa shoot or even main camera on a tight budget. Camera body and Ninja combined add up to just a bit more than the BMCCC and gives you Full frame or cropped sensor options as well as 720p 50fps for slowmo. A worthy alternative I feel – as long as you aren’t too heavily invested in Canon Lenses. Hi Vincent, I have a Canon question and would really appreciate your opinion. Will Zeiss 18mm prime lens work on the 1 DX without vignetting or barrel distortion for VIDEO? I’ve been unable to find an 18mm prime that covers the full frame (Vista Vision) sensor. I love full frame wide angle for video! Am I out of luck here? Does it not exist? Is my only hope (to get 18mm FOV) to use Super 35 camera and a zoom lens? Like the Scarlet with an Angenieux 15-40? Help! Love your work bro and thanks!! The Zeiss 18 ZE will work yes. The Zeiss 18mm CP.2 will not cover the full frame. @Vincent Laforet, I shoot snowboarding and my holy grail would be to have the option of using the Arri mount standard 16mm Angie 12-120mm, and 5.9 prime that that have been sitting on the shelf. Would it be hypothetically possible to have an Extended Tele mode/ or window mode similar to the GH2 or RED? As you can imagine slow motion is very important for me as well. I’m hoping for a 720 60p firmware upgrade. Even if it’s only a burst. I know this camera can’t be everything to everybody, I think it’s very exciting but for what I do it’s not quite there yet. That’s the one I used… are there two USB? I used the one inside the SSD door… and it didn’t work. My thought is the cable I used didn’t put out enough power. I am wondering if you could just use a lens extender to enlarge the image circle? It might not work with fixed focus lenses I suppose, and you sacrifice one stop for a 1.4 extension. I believe Stanley Kubric attatched angeniaux zooms designed for 16mm in his 35mm camera. I wonder tho if the long lens port will make a massive difference on fixed focus lenses? this camera along with some disappointing negatives. is much better than I am as a shooter. If you were forced to use the BMCC with only one lens that costs under $1,000, which lens would it be? Question here- I just got hired by a night club to record live events/musicians that come to the club. Is this the type of camera for that? Or does this require much more control. I’m usually walking through crowds getting bumped around and setting up shots at a moment’s notice based on what the musician is doing live. If not this camera what one might work better, an FS100? I’m even considering the Canon C100 considering its low light capabilities and my preexisting collection of Canon Glass. At that price though would it make more sense to go with the FS-700 for the slo-mo look a lot of electronic artists want? FS-700 over the C100 I think – haven’t seen the C100 in person though… slow mo of FS-700 is tempting! My point to Kris and the guys at BMD early on was that what the camera needs is a different mount with a shorter flange depth. Even if 16mm lenses would cover the sensor (I mean, you could always use them to shoot 2.35:1), there’s no way to mount them on this camera because the Canon mount is too far away from the small sensor. Personally, in preference to a S35 sensor in the first update, I would like to see a universal (BMCC) mount with the shortest flange depth they can manage and a selection of adaptors for Canon, Nikon, Micro 4/3, PL etc. so lens options on the wide end are opened up. Interestingly enough my calculations show that a super 16mm sized crop of this sensor (losing a bit of height to make it 16:9 aspect) gives just a few pixels over 1920 x1080. It would lose the sharpness benefits of oversampling but maybe with the right kind of sharpening, in camera or post, could be usable. Let’s hope they can commission or find suitable sized sensor next time round that actually matches with the coverage of the lenses for the mount they put on it. It would be wonderful if we could use super 16 lenses on such an affordable camera with such great codec and media options and dynamic range + colour rendition. Especially if it was ergonomic to use for documentary style EFP shooting and had hot swappable batteries with long runtimes. I’m sure it will come soon – the question is who will make it first..
Great review, a real joy to read. where did you get this information? talked to someone at ARRI nyc today and they said this was not true. That’s what I was told by someone from Arri. It was someone high up at Arri – there is some type of diffusion in front of the sensor I was told. If I remember correctly it’s a 1/4 soft. Who did you speak to and actual Arri employee and whom? Vincent, Is the image, sharpness and dynamic range better than Sony FS700 or Canon C100? A C100 isn’t out in the wild yet. DR with RAW will be better than FS700 and C100 – can’t speak to sharpness. I haven’t done side by side tests. Thanks Vincent, lovely informative article. You said if the sensor size was 35mm then – “ergo a more expensive camera that would quickly reach the price of a RED Epic or Canon C300/C500” now thats true and would make it maybe more appealing to your good self as you have an impressive and very blessed arsenal of cameras and gear to work with, however for me to get a good quality picture nearing the c300 and RED, I would purchase this as money is an object (and hurdle at times) for me. Your projects and investment capabilities may accommodate a 35mm version of this where as for me the crop version is affordable. I know you have a wide spectrum of readers that visit your site but I am at one end and if this was a 35mm version, then I would be reading your article in the same way I do if its a 1dx or c300/500 review, its just knowledge to me not a realistic purchasing opportunity at this stage of my career. You are gifted Vincent and you rock!!! A realistic review. Thanks. Personally I don’t see how you can shoot a camera handheld without having physical dials and buttons to adjust? So a decent studio camera only? It will work fine w/ a cine rig/handheld rig as w/ DSLRs. Please can you elaborate on the Aperture control or F-stop control on this camera with Canon EF lenses…… it’s too confusing!!!! How would i play with the F-stops in this camera??? you can’t precisely… you hit the iris button and it auto exposes you can then go up and down one stop at a time from there with button (but it doesn’t read out anything) then you use your vari ND. I’ve been going back and forth on purchasing a Scarlet or the BMCC. After visiting Red this summer and toying around with the camera I fell in love it but I just couldn’t drop 25K. Do you think the image of the BMCC can compete with the Red in commercial work? I’d love to see some footage of the 422 prores codec running on this camera. @Vincent Laforet, Thanks for the reply Vincent, I agree with you. Does the MFT option change things a little now in your opinion? For me, having Canon Glass, I think I will stick with the EF mount version, I am an indie filmmaker and can’t spend thousands on separate glass. Wow. Out of my price range, but wow! BMD has just announced a new mount! It’s a manual 4/3 and it will fit a wide range of lenses, including those old 16mm lenses, anamorphic etc. With easy adaptors one can fit almost all lenses around. PL, M, Nikon, Canon. C mount etc. So, the crop factor is actually gone with this. Very smart move. Ships in December. I’m shooting with a GH-2, editing with Vegas 11 on an two year old IBM. I could add 2 more Gigs of memory, up to 6GB I think. Wondering about the total cost adding an external battery, Card (s) a wider lens. I have a Tokina 11-16. And a New Higher End Computer??? Getting plenty pricy. I’ve heard of some people having issues on PCs – but you shouldn’t. The right software is definitely out there. And yes – it can get pricy… but so can any camera these days. @Vincent Laforet, I had a chance to handle the Black Magic at IBC in Amsterdam yesterday. I did a quick test to look at the rolling shutter issue. Yes, it has rolling shutter but in my opinion it is about the same as a DSLR possibly a bit less dramatic. In this aspect don’t expect too much of a difference. Hope this helps. Think again – it’s about as bad as the original 5D MKII. Most of the DSLRs have less of it. I was expecting to have a lot less of it given how small the sensor is and given that the processor has to scan fewer pixels than on a 5D MKII for example. @Ty Stone, experience is the greatest teacher just go out there and shoot something get your hands dirty. Sorry to be harping on the same subject but I do see a sub $3,000.00 camera with clean HD-SDI out (BNC) and Thunderbolt out as progress. I will agree that the BMCC is not perfect’ but it certainly is a great point of departure for the price. I think that Blackmagic Design should be given the benefit of the doubt in that they are willing to listen to what is being asked for and will update the firmware and hardware as needed.Case in point the the MFT model coming out in December. They are new at the table when it comes to cameras, but by golly ( yes I said by golly)what a fantastic start. I am not disagreeing with anything you are saying I am just pointing out that the price point is what makes this camera so interesting. The value of these devices ( I include HDSLR’s) that are affordable is in that they level the playing fields and unlock the imagination of those of us that cannot afford to play with the “Big Boy” toys. Still haven’t decided if i am going to buy one or not, i love the MFT mount version, though. But what i know is that i am just LOVING to see a company like Blackmagic coming up with a small game changer. Maybe now the big boys will actually start making better cameras for a better (decent) price. Does this mean that you are coming over to the “Dark Side” ? What I try to get through to people is that I don’t take sides at all. Almost every camera has a sweet spot – just as every film emulsion and format did – and I think it’s best to learn each tool’s strength and weakness. Now that the µFT mount is announced, what do people think, about using Super 16mm lenses. There is some great Distagon glass out there from Zeiss. I know that the 8mm won’t cover the sensor, it hardly covers Super 16 (only TV safe area). But what about the 12 or the 16mm? Does anybody know their image circles? FYI, most wide Kern Switars don’t cover the BMCC, but they were made for 16, not Super 16. Thanks for your review, so informative. I have a set of five Zeiss T* lenses for my Contax RTSIII still camera, from 16 mm to 135 mm. Will these work with this camera? It would be a superb combination, the lenses are excellent. Alan – I’m sorry but I don’t know. Please share what you can find out with us (through a local camera shop perhaps_… if you can’t I can put you in contact w/ someone at Zeiss. Hi there, do you really think the Schneider variable filter is better than Heliopan? I haven’t played with the Heliopan. What I CAN say is: this filter blows away the Faders filters and others I’ve used – and there is no visible loss in sharpness or cast. It also has a greater VARI ND range than the heliopan and is slightly cheaper… if Heliopan wants to send me a test filter, I’d be happy to do a side by side test! Thank you for the very informative write-up Vincent. The variable ND comment is a very valuable and I appreciate that as well. Of course that filter is far too rich for my blood, it’s good to know in the event that changes. The only thing I would say about the file size as far as DNGs and your Retina MacBook is that you would probably get significantly better performance from a 15″ non-retina display MacBook and the GPU wouldn’t be preoccupied with the task of power the massive display requirements of something like 4x “normal” display resolution. That laptop is just not designed for anything but proofing photos and probably using Aperture/Lightroom. (looking at that even further considering 99% of computer users/large screen film watchers don’t have retina displays they’ll never see 60% or more of what you’re seeing at the top end of you display capabilities. You can always “make” it work – but the two won’t look very similar as the BMC’s range is amazing compared to DSLRs. Thanks a million for the reply ….1 last question i missed do u know the Mbps of this cam in both raw and prores? I do not no. Early morning after three long days of shooting. I think it’s similar to the Epic 50MB p/s it’s up on the web. @Vincent Laforet, Hi i have a BMCC 2.5k MFT mount camera.I am looking to shoot mainly music videos but do intend to dabble into short films and event coverage. can you advise on the best lenses to get. so far am for a great wide angle lense, a prime and a standard lense with any two more lenses Keeping in mind that i want to shoot music videos for will the ok for short films and event coverage as well. I have a tight budget so not looking to go all out. Looking for good quality for decent prices. @Frank, does anyone know the MBPS on BMCC ? Don’t know exactly how accurate that is though!!!! I wonder what dead pixels look like on this sensor. Anyone know? Also, the chemical process of silver halide crystals of infinite shape and size and no compression produces a much different and more organic image than the electronic process of finite sized square pixels so the sensor size argument against film has other considerations no one is talking about. @Vincent Laforet, You could always join the queue for a Duclos Tokina! This is a very informative and interesting post to read. Thank you for posting this! I strongly feel patience is an advantage someone should have in the case of BMC. Useful info. Lucky me I found your site by accident, and I am shocked why this twist of fate didn’t happened earlier! I bookmarked it. under 10 k alternative ………………ikonoskop anyone? we do mostly HD Multi Camera Live projections.is this camera we can fit with ENG Style longer focal length Lenses. attached with External HD Recorders ,can record better HD Footage. Thanks for an informative, thorough article, Vincent. Many predicted some years ago that shooting a full feature film with a HDSLR would be an impossibility. However, a great deal of scenes in Acts of Valor were shot with EF lenses attached to a 5D Mark2. Would it be possible to get similar or even better results with the Black Magic Cinema Camera? What are the chances that a blow up would satisfy distributors for the purpose of theatrical release? @Steve Miller, I use ZF.2s with that precise adapter. They work fine on the 7D and 5D at least. @Vincent Laforet, I am thinking of using a BMCC for an upcoming production. Through my university I can borrow a Sigma 10-20mm F4-5.6 wide lens. I know it’s a cheaper product, but do you think it would be adequate for a few wide establishing shots? I haven’t used that lens .. but if you don’t shoot it wide open and shoot in daylight you should be just fine in my opinion. Hi there, I noticed your blog on http://blog.vincentlaforet. while browsing for a related topic, your blog came up, it seems great. I’ve saved it in my google book marks. Love your work and reviews, will you be doing a review on the new 4k? Hi i have a BMCC 2.5k MFT mount camera.I am looking to shoot mainly music videos but do intend to dabble into short films and event coverage. can you advise on the best lenses to get. so far am for a great wide angle lense, a prime and a standard lense with any two more lenses Keeping in mind that i want to shoot music videos for will the ok for short films and event coverage as well. I have a tight budget so not looking to go all out. Looking for good quality for decent prices.